CybAero AB, Sweden, and Astrium Satellites, part of the aerospace group EADS, have launched a partnership in the field of precise near-field navigation for automated UAS landing operations. By applying the principles of Global Navigation Satellite Systems on a local scale, the Astrium “High-Precision Local Navigation System” will provide highly accurate relative position and attitude information to the CybAero UAS during its final approach phase. This system will now be tested on CybAero’s unmanned autonomous helicopter APID 60, but can also be used to navigate manned helicopters in their final approach phase. CybAero develops computer-controlled, unmanned helicopters, known as VTOL UAS, in cooperation with some of the world’s leading defence technology and aerospace companies. Recently CybAero began a cooperation with Europe’s leading satellite company, Astrium Satellites, on automatic take-off and landing systems. “Our helicopter UAS are tailored for use on smaller vessels such as the Visby Class corvettes of the Royal Swedish Navy and Coast Guard vessels. The challenge has been to land on unstable sea vessels”, says CybAero CEO Leif Erlandsson. “Based on the Astrium Positioning Sensor, together we will be able to develop a unique system that controls the approach, automatic landing and lock-down on the ship’s deck. The same technology can be used for mobile landing platforms at land. Our goal is to develop a system that can take-off and land on a moving truck”, says Erlandsson. CybAero develops and manufactures Unmanned Aerial Systems for both military and commercial purposes. The company was founded in 2003 using technology based on research initiated in 1992 by Linköping University and the Swedish National Defence Agency. The headquarters is located in Linköping Sweden, with sales office in Abu Dhabi in the United Arab Emirates. Swedish UAV manufacturer CybAero AB, listed on NASDAQ OMX First North in Stockholm, in collabora6on with the Norwegian Coast Guard and Coastal Agency, has conducted a series of flights with its unmanned helicopter, the APID 60, in winds up to gale force. The flights took place over the Arc6c Ocean, near the Norwegian village of Vardø, on behalf of “Arc6c UAS” (Arc6c Unmanned AircraN Systems). During these flight tests the APID 60 carried a high precision landing system from EADS Astrium enabling fully autonomous, precision take-offs and landings from ships. The flights were carried out under realistic conditions in some of the world’s most extreme weather conditions. In collaboration with civil organizations, inter alia, the Norwegian Coast Guard vessel KV Farm and the rescue and service vessel Normand Jarl, different applications were tested such as shoreline search and rescue, the monitoring and controlling of oil spill clean-up efforts at the deployment of oil booms. CybAero also simulated missions such as reconnaissance and surveillance of terrorist and smuggling activities. skilled team that can develop systems tailored for difficult and dangerous missions” says Leif Erlandsson, CEO of CybAero. Vardø is located off the east coast of the Norwegian Polar Sea, north of Kirkenes and Murmansk. landings on moving ground on its Neo series. After successful joint flight trials on Board of a German Coast Guard Vessel last autumn, Swiss UAV now signed a respective contract with EADS Astrium. The contract foresees the full incorporation of Astrium’s DeckFinder High-Precision Local Navigation System into the Swiss UAV Neo and its modernized avionic suite for UAV systems. DeckFinder is a GPS independent, relative navigation system that provides the UAV autopilot with the relevant relative positioning & heading information during start, final approach & landing. DeckFinder consists of a ground segment of six locally deployed ‘Satellites’, and a corresponding airborne receiver. Based on the DeckFinder generated information, the Neo series can now be safely operated from ships or trucks. As the DeckFinder System calculates the relevant navigation information for start and landing directly inside the UAV flight control computer, landings under emergency conditions could still be performed, even in potential communication link-loss situations. As DeckFinder does not rely on GPS, it enables the UAV to continue approach & landing also in GPS jamming scenarios. 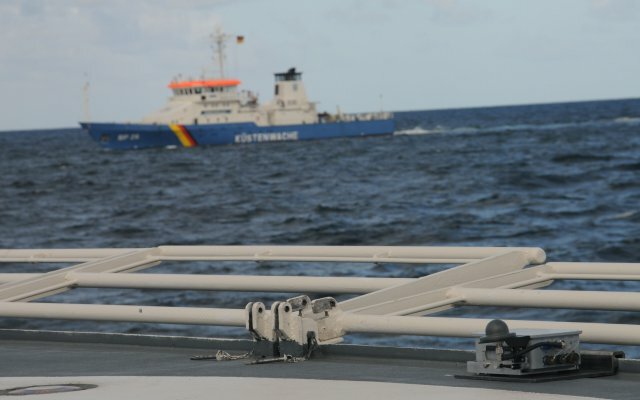 If DeckFinder is operated with two Antennas on the UAV, it also provides the autopilot with attitude information – a feature that is especially relevant if the UAV’s magnetometers are disturbed, as they have been during the tests performed on the German Coast Guard Vessel last year. 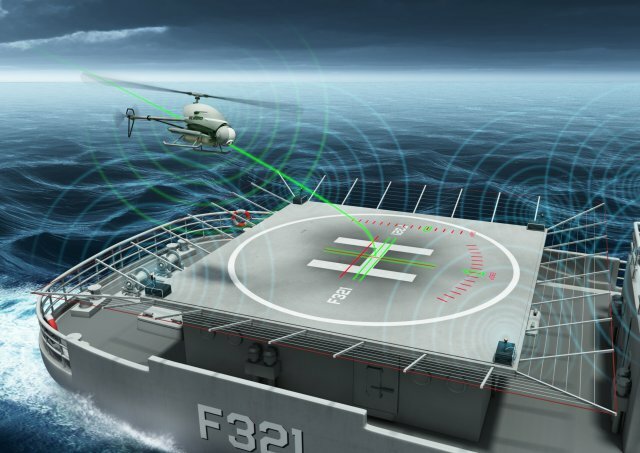 In order to operate up to high sea states, the DeckFinder signals have been designed to be weather independent, and the high update rate provided to the avionics system enables the UAV to also cope with highly dynamic situations. Swiss UAV will have completed the integration of DeckFinder into its new avionics suite within the next months. This upgrade goes hand-in-hand with a broader avionics systems upgrade, both on Swiss UAV’s ground and airborne systems. The new Ground Control Station has been redesigned to NATO STANAG standards, and the upgraded Flight Control Unit will provide additional state-of-the art flight modes, one of them being the capability to perform ATOL on moving ground.